If you haven't seen Inception yet, then stop reading this review. I'm serious. Get up now and go see the movie. My review will still be here when you're done, but you only get one chance to see Christopher Nolan's remarkable mind-bender fresh. Inception is one of those movies that is going to be so much better the first time the less you know, and anything I say from here will only serve to lessen your experience. So, close the laptop, shut down the monitor, and go to the theatre. 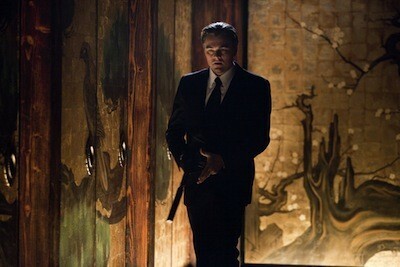 Christopher Nolan's Inception may be the most satisfying movie I've seen all year. I hesitate to call it a perfect film, as that's a pretty precarious limb to walk out on, but this is about as close to perfect as you're going to get. I can't think of anything wrong with this movie: no performance that hit a bum note, no story point that seemed out of place, no pandering to market research. Hell, I don't even think I saw one instance of product placement. Leonardo DiCaprio never eats a Subway sandwich, Ellen Page never has a Coke to go with that adorable smile. 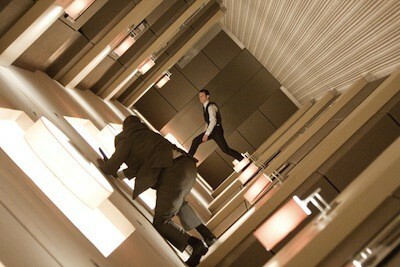 Inception is, essentially, a science-fiction suspense thriller. It stars the aforementioned Mr. DiCaprio as Cobb, an expert at extraction--which in this world means he goes into a target's dreams and uses the mental landscape to trick him into giving up his secrets. Doing so is a team effort, involving architects to build the dream world and technicians to run the machines that link up the shared consciousness. Nolan has described it as a Jungian version of Rififi, and that's not a bad way to sell it. Though I might have gone with The Grifters, as the set-ups Cobb and his people create are more like long cons than heists. Create a scenario that the mark will believe, and then direct him where you want him to go. Naturally, there are some practical applications in industrial espionage, a competitor can send an extraction team to find out what a business mogul is up to. Just such a mogul fends off Cobb and his boys, only to turn around and hire them to pull off the impossible. Saito (Ken Watanabe, Letters from Iwo Jima) is a Japanese tycoon with concerns in global energy, and he wants Cobb to infiltrate the subconscious of a rival (Cillian Murphy, Red Eye) not to take data out, but to leave it behind. Inception: to inspire an idea where previously there was none. It's the holy grail of mental games. The mind will search for the origin of the thought and discard it if it doesn't believe it's one of its own. Cobb assembles a team of four for the mission: his regular second, Arthur (Joseph Gordon-Levitt, Brick); Eames (Tom Hardy, Bronson), an expert forger; Yusuf (Dileep Rao, Avatar), a chemical specialist; and a newbie architect named Ariadne (Ellen Page, Whip It). As if fans of Greek mythology couldn't tell by the name, Ariadne is an especially good choice because she is an expert at mazes--both building them and traversing their intricacies. This backfires on Cobb, as Ariadne's the only one to realize he's trapped in his own labyrinth of guilt and thus a potential liability. Past misdeeds and a wife missing in action (played with smarts and the occasional sinister glee by Marion Cotillard) haunt the head man, and this mission may be as much about solving his own hang-ups as it is getting Saito what he wants. That's the basic plot of Inception. Digging into it further would be a Herculean task, and as noted at the outset, would spoil most of the fun. Nolan has written a multi-layered script. Behind each secret is a more important secret, and for every clever concept he tosses at the viewer, he's got three more waiting around the corner. As a narrative, Inception is a thing of beauty. There are so many interlocking pieces, a less capable director wouldn't be able to handle it. They'd rely on the weirdness of dream imagery and convoluted fake science to carry the story (you know, like Paprika). Not Nolan. The dreams are his tools, and though he twists and bends them, he ultimately puts every device to its proper use for building his yarn. Inception will keep you guessing, but it never leaves you behind. Nolan's storytelling is as accessible as it is confounding. It seems so effortless, and yet, how did I get so tense watching it? Visually, the director and his regular cinematographer, Wally Pfister, bring the world of Inception to life in such a way that the cracks between reality and illusion never show. The computer graphics are imperceptible, even when they are as audacious as a city curling in on itself. In other words, you will believe your eyes. 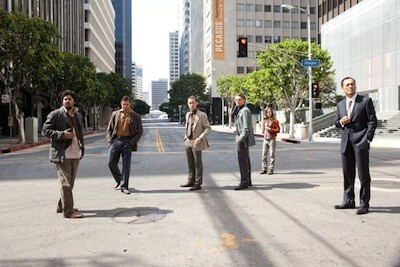 It also helps that the cast of Inception is so incredible. There is no lesser player in this game. Nolan has picked actors who are reliable for their quality, yet also never complacent. It's hard to single out any one. Ellen Page and Joseph Gordon-Levitt both turn in intelligent, confident performances, with Gordon-Levitt having the added distinction of delivering an impressive physical performance, as well. Ken Watanabe's commanding presence works well against Cillian Murphy's façade of the same, Tom Hardy is surprising and fun as the most playful member of the group, and Marion Cotillard is alluring and even scary. They all provide DiCaprio with excellent support, and yet he doesn't let them do any lifting he should be doing himself. One of the more interesting leading men in Hollywood, he grows more capable with each starring role. To stick with the mythological connotations, he is the Atlas on whose shoulders the world of Inception rests, and he is more than up to the load. For as much as I want to encourage people to walk into Inception cold so that every surprise is still a surprise, it's not a movie that relies on a single trick or twist. It's not a film you'll never want to see again after you've learned its secrets. On the contrary, Inception has so much going on, it's going to be a film worth revisiting over and over just to watch how it all works. Hell, as soon as it was over, I would have been just fine had the projectionist started it again from the beginning. This is one dream I'd be more than happy to have reoccur.